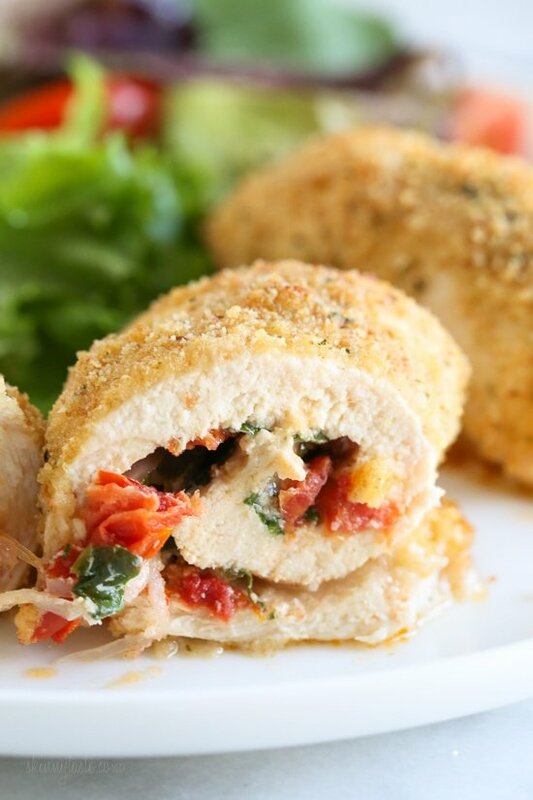 These Sundried Tomato Stuffed Chicken Breasts are filled with Sun Dried Tomato Bruschetta, mozzarella and spinach, rolled, breaded and baked in the oven or air fryer. These are so easy to make, and the chicken comes out so juicy and delicious! Easy enough to make for a weeknight, yet elegant enough to serve for guests. Serve this with a salad, or a simple pasta on the side like broccoli and orzo. What makes this chicken dish extra flavorful is this Sun Dried Tomato Bruschetta from DeLallo, this stuff is so good and not just as a bread topping! If you’ve been to the DeLallo store in Jeannette PA, you probably understand my obsession with their products, but the good news is you can buy all their products on their online store. I kid you not, their marinara sauce is the best jarred sauce I’ve ever tried and that’s coming from a girl who never uses jar sauce. Combine breadcrumbs and grated cheese in a shallow bowl. Combine olive oil, lemon juice, and pepper in another bowl. Preheat oven to 450°F. Lightly spray a 9 x 12 baking dish with non-stick spray. Place each cutlet on a work surface such as a cutting board and spread 1 tbsp sun-dried tomato bruschetta, 1 tablespoon mozzarella cheese, 1 tbsp spinach leaves and 2 to 3 slices red onion in the center. Roll and place seam side down on a work surface. When finished, dip into the lemon oil mixture, then into the crumb mixture and transfer to a baking sheet. Spray the top with olive oil spray. Bake 25 minutes, until golden and cooked through. Follow steps above 1 through 6. Preheat the air fryer once again to 400F. Spray both sides of the chicken with oil. Cook, in two batches 12 minutes turning halfway. I made this last night for about the 5th time. We love it, but I don’t call it an “easy” to make meal. Preparation and organization are the key to making it fun to make. My dredging and filling bowls have to be set up just so. We added fresh garden salads for our side dish. I only had fat free mozzarella and my Bruschetta was “tomato bruschetta” not “sun dried.” I was cutting calories to cut WW points. it definitely lost a bit of flavor. The sun dried tomato version is worth the extra point. Do you ever use fatfree shredded mozzarella or cheddar cheese? I want to lower the points as much as possible. what would you recommend as a side dish for this recipe? These were very good! I used diced sun dried tomatoes in place of the bruschetta and it turned out great. Hi, I have been following you for years. I follow the smart points program. I noticed your recipes now give freestyle points. Are us smsrtpoints people now by the way side. Do we have to figure points for ourselves ? Sorry the plan changed which means the recipes in my data base changed. This recipe is easy and abouslotley delicious. Tender chicken and big flavor. Thank you for sharing! 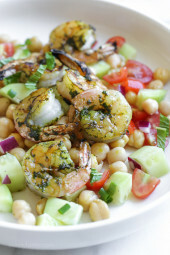 Sounds so delicious I am making this for my dads birthday dinner tonight. However was going to substitute the motzerella out for goat cheese. Do you think that goat cheese is too soft to cook in the oven that long or will it still come out ok? Thanks! I am sure it would taste great! This recipe was delicious. My whole family loved it! I had a hard time finding the Sun Dried Tomato Bruschetta, but I ordered it online with Wal-Mart. I noticed that lately they have a lot more Organic products, and online they have a ton of Delallo products which I have a hard time finding locally. Would it be possible to prepare this the night before and then bake after work? Have you tried using regular sun dried tomatoes instead of a spread? I wouldn’t bread it til you were ready to cook. No I haven’t tried but I don’t see why that wouldn’t work. Can Sun dried Julienne cut with extra virgin olive oil tomatoes with Italian Herbs work in the place of the sun dried tomato bruschetto in this recioe since it’s all I have? This was a huge hit with my husband. He wouldn’t stop asking me questions about this dish:) I’ve never used low-fat mozzarella, but it really does the trick! I’m taking the leftovers for lunch this week, my husband was very disappointed…. Lol! Glad you enjoyed it! I have sundried tomato pesto from DeLallo. Have you ever used that instead of the bruschetta? Yes that would be really good! I’d love to make this for my husband and have it last for 2 dinners. How would you suggest I heat up leftovers? Or would you recommend not using leftovers for this dish? Thanks! I used Barillas sundried tomato pesto. It was absolutely delicious!! Can these be made and freeze just prior to cooking? I made this last night and it was delicious! I used a bruschetta from the store I could not find sun dried bruschetta Thank you!! Have noticed that I haven’t been receiving your daily email recipes. Has this been discontinued? Thanks and hope it hasn’t been discontinued. While I don’t use every one of them; the ones I have used have become favorites! Sorry there is an issue, I am working on it! 450* seems like such a hot oven. Most recipes I have suggest 375* for chicken. Why so hot? This was so delicious and super easy and quick! I haven’t made anything on your site that I don’t love! This was awesome! However, I think next time I will leave out the sun dried tomato bruschetta and instead dip the rollatinis in a nice side of marinara (to save some calories and I think it might taste better too!). Thanks again, these were a huge hit! I’ve never left a comment about a recipe before so the fact that I’m doing it now means a lot! Mine didn’t turn out quite as pretty as the one in the pictures and videos, but the taste was amazing! My husband – a somewhat picky eater – even went back for seconds! I’ll definitely make this again. I was in a time crunch but I would pound the chicken a little flatter next time to help with the rolling process. I made this yesterday and it was so delicious. I felt like I was eating in a fine restaurant. Can’t wait to make it again Thanks Gina !!!! Made this tonight using the olives I had used earlier in the week to make the picadillo, it came out great! Will definitely make again with the sun dried tomatoes. Loved it!! You have fantastic recipes! Made this last night for my family. It was absolutely delicious! Every time I try to make stuffed chicken it falls apart. How do you keep it all together? Putting it seam side down doesn’t work for me. Made this with a few substitutions (lack of ingredients and skill 😉 and it turned out super tasty. Mixed sundried tomatoes and basil and used arugula instead of spinach. When it came to the rolling, mine was a bit messier, so we used a toothpick and drizzled the lemon mixture then topped with the bread crumb mixture and extra mozza. Very tasty and actually quite elegant looking! Thanks Gina! What is the saturated fat count? Made this and added some fresh herbs inside, brilliant dish, thank you! sounds delish and cannot wait to try! Have you ever tried the Delallo fat free marinara? Curious how good it may be. 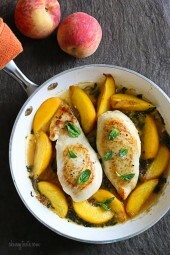 Thank you for this recipe – I cooked it tonight and it was delicious! I made it gluten free with gluten free breadcrumbs. How do you think this would come out in the air fryer? I don’t have one so I’m not sure. That’s how I made them, and it came out perfect! So crispy and yummy! I just followed the temp/time instructions that I had for another recipe I had for baked chicken “fingers” and that worked fine. 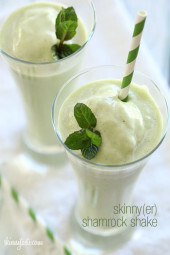 Hi – looks delicious and I want to make this. I keep kosher , so I wouldn’t make it with cheese. Do you think it would come out Ok leaving it out? or do you have a non-dairy suggestion? thanks! Allison, you could use dairy free cheese such as daiya, or go veggie substitute. What can you use if you don’t have the bruschetta sauce??? I used chopped sundried tomatoes plus a bit of chopped fresh basil. It’s in the oven cooking now!